Pretty boy alert! A hot, young Latino artist is blazing the concert trail, and a bunch of avid and some rabid fans are following his tracks. Colombian reggaeton star singer-songwriter Maluma is hitting 21 cities in stops in the U.S., including Canada and Puerto Rico. The tour dubbed as "11:11", is in support of his brand new album. Maluma recently capped his highly successful $16 million-earner F.A.M.E. Tour, which covered 22 dates in the U.S. alone. This is a highly anticipated show and this is one hot ticket. You've alerted, now get into action. All it takes is a few easy clicks starting with the 'Buy Tickets' button you see on this website. No reason to hold back…book your tickets now! The words 'young' and 'veteran' used in one sentence to describe an individual may sound like an oxymoron. But it's really the case for Maluma. He is classified as a veteran in terms of his track record, his achievements, recognition, and his exposure on the live stage. Yet, in terms of age, he is at his prime, currently 25 years of age. And yes, to answer that question you've been dying to ask — he's a hottie! Juan Luis Londo̱o Arias — a.k.a. or known by his stage name, Maluma, cut his first indie release, then was signed by a major label at a young age of 17. In 2010, he released his first single "Farandulera"; which was followed by his major debut single "Loco". Driven by exposure and fan engagement through the internet and social media, plus extensive traditional radio airplay, Maluma experienced an organic surge in popularity. Maluma's singles are certified top 10 on Billboard Hot Latin chart hits. These singles include "Felices los 4", "Borró Cassette", "El Perdedor" and "Corazón". He has also won a Latin Grammy Award and two Latin American Music Awards. Citing Héctor Lavoe, Justin Timberlake and Michael Jackson as his main musical influences, Maluma defines his music as "urban pop". A Billboard Magazine editor describes Maluma’s music as a "… brand of reggaetón syncs nicely with his image, managing to be both romantic and raw. His sound represents an evolution of the genre." Maluma is a regular staple at the US concert scene. But the crowds get bigger, the screams get louder each time. 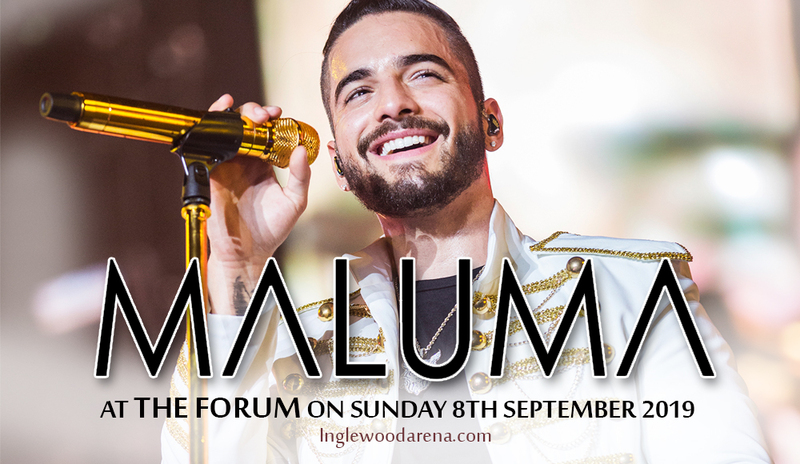 And Maluma is pleased to come back time and time again, to share his music to a live audience. “This will be my third North American tour and I come with a brand new show full of surprises,” he says. Don't wait 'til the last minute. Book your tickets now and get yourself a good seat where you could witness a charismatic young performer and give you an enthralling evening you'll never forget.